Truly gorgeous wedding cupcake decoration is not only about the looks but also about palatability. 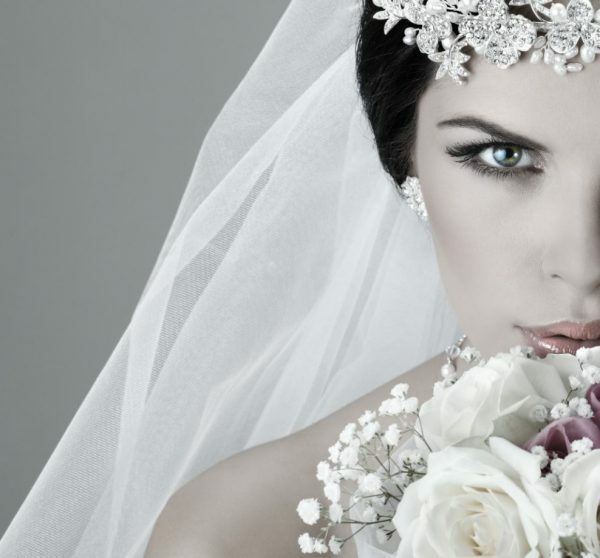 Planning a wedding may seem like a daunting task. However, some aspects are more interesting than others. A good example is choosing pastries and cakes! This post intends to provide you with wedding cupcake decorating ideas that you will surely find surprising and mouthwatering! Did you know that cupcakes make perfect guests favors too? That’s why I’ve added a delicious chocolate cupcake recipe that’s easy to make at the end of this article. I also provide packaging tips and ideas to display them. 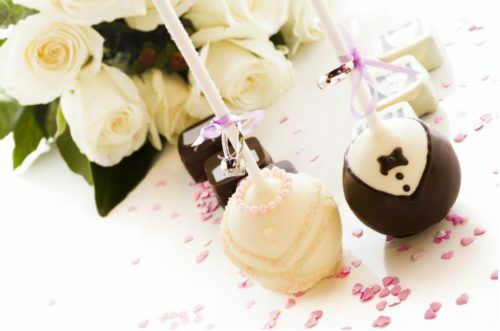 Your wedding guests will love this charming and delectable treat! These cupcake ornaments are simple and can make any cupcakes look elegant and charming. 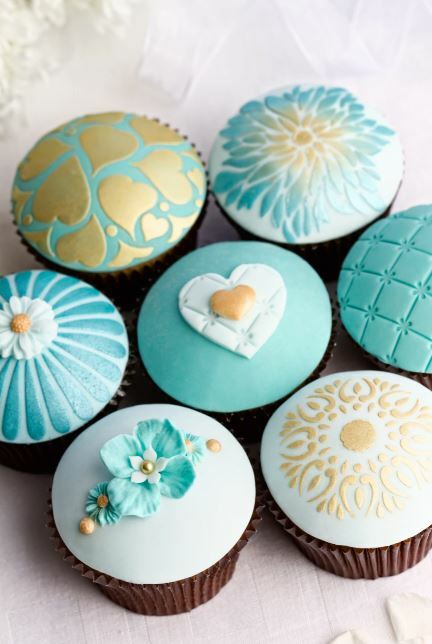 Here’s a list of 7 of the most creative ways to decorate cupcakes and pastries in general. Your guests will surely appreciate having the option of choosing what they want to have on their cupcake. You can have cupcakes with a simple icing on top of them and leave others plain. Provide your guests with different candies, nuts, fruits and even edible flowers to choose from! Offer cupcakes with a simple icing on top of them and leave others plain. Provide your guests with different candies, nuts, fruits and even edible flowers to choose from! 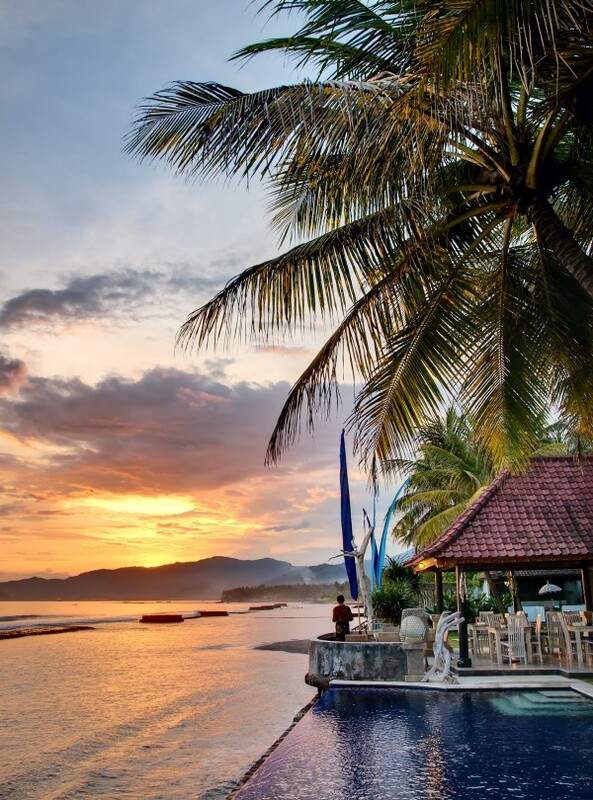 Offer your guest a gastronomic experience with the most exquisite beverages. You don’t need to spend hours trying to find the perfect flavor combination to have an extraordinary tasting cupcake. The simplest cupcake recipe can be enhanced with a quality alcoholic beverage. Spirits and liquors can enhance the taste of a simple dessert. Plain cupcakes are delectable when paired with Grand Marnier, Kahlua, and Pinnacle Ice Cider. Just add a slice of pear or apple and 2 to 3 berries and you have a 5-star restaurant quality dessert! You can create an impressive table setup by arranging the cupcakes into… whatever you can imagine! It can be a wedding gown, intertwined wedding rings, multiple heart shapes or an abstract shape of your own creation. To give you an example, have a look at what betterrecipes.com came up with. (I’ve embedded the link to the actual article, not the general website). There are many videos out there to teach you the basics of arranging cupcakes into a specific shape. As an example, here’s a tutorial to help you make cupcakes shaped into a wedding gown. This one is different from the flat design showed above since it’s mounted in a way that you can admire it from many angles. 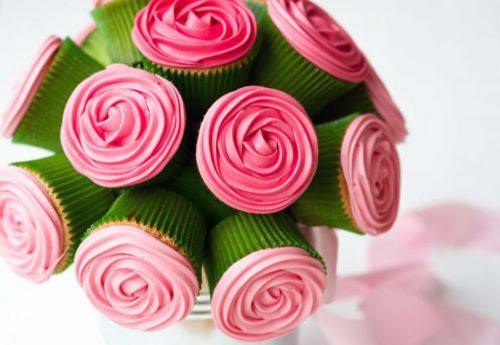 You can make a bouquet with cupcakes and even a cupcake tour or what most people call a cupcake cake using a stand. If you want to have a cupcake bouquet you’ll need to mount them on a foam ball or some other kind of solid support. It’s definitely an impressive three-dimension chef-d’oeuvre! Printing technology contributes to making wedding cupcake styles and decoration unique. Pastry techniques have evolved in a way that it’s now possible to print an image on a cake or cupcake. This is possible by using edible sheets and inks on a printer dedicated to edible printing. Printing sheet can be made with rice or potato flour and also sugar. Nowadays, this method for decorating cupcakes and other patisserie is commonly used to make intricate patterns that are almost impossible to do by hand. It’s now possible for you to select a picture of you and your spouse to have it printed on your cupcakes. But the possibilities go far beyond that. You can print the most delicate patterns like lace, bark, leaves, damask, butterfly wings, etc. Most professional baker shops can provide this service at a low cost compared to making the designs using a coupler and cake decorating tools. Having trouble deciding what wedding cupcake decoration or type of sweets to go with? Who said you had to choose? Mix different types of pastries to make it even more fun! You can simply use the same theme decorations for all of them so that your guests can pick their favorite. Another idea is to decorate them in different ways with wedding theme related designs. 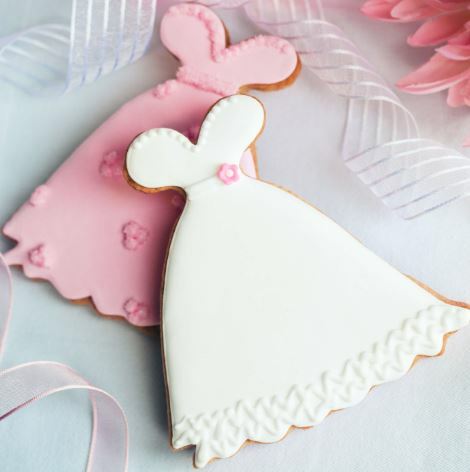 For example, your cupcakes represent the bride and groom outfits and the cookies the bridesmaid’s dresses. I can feel my stomach grumbling already! These days, cupcakes are a hot trend for weddings favors and also a popular alternative to the traditional wedding cake. In fact, they can be an interesting option if you plan to make it yourself and don’t have a significant experience cake confection. Here are some nice ways to present your cupcakes. Find inspiration with wedding cupcakes pictures, check!… What’s next? Well, the logical next step would be to try and make your own cupcakes? That’s when the fun part begins! There are many good cupcake recipes out there on the Internet and you probably have a couple of them in your drawers. I know mines are filled with piles of recipes that were given to me by family, friends, and colleagues. If you’ve always thought that baking pastries required chef skills, I bet you will like the following recipe. Here are the steps to make a plain chocolate cupcake on which you can build on. For example, you can add wedding theme ornaments, fondant details, frosting, etc. As I mentioned earlier, practice is the key. If you plan to bake cupcakes for many guests (20 or more), I suggest that you start by making 12 units with this simple recipe. Once you master the recipe, you will be able to make more cupcakes for your wedding guests. The ingredients provided here are those required to make a basic cupcake before you add any icing or decoration elements to it. There are many options to decorate your cupcakes and add complementary flavors to your chocolate basic cupcakes. 1 – Preheat the oven to 180 °C (350 °F). Make sure your rack is in the middle position. 2 – Add the paper liners in a 12 mold muffin tray or cupcake tin. 3 – Combine the flour, baking powder, baking soda and salt in a bowl. 4 – In another bowl, combine the sugar and cocoa. Add the oil, eggs, vanilla and beat at high speed with an electric mixer until mixture is smooth and homogeneous. 5 – Add the dry ingredients alternately with the milk using the mixer at low speed. Scoop the batter into the molds. 6 – Put in the oven. Important Note: the baking time required is specific to the oven you are using. Convection or fan oven cook faster and more evenly than regular ones. I suggest 15 to 20 minutes. To see if they are cooked correctly, you can insert a toothpick in the center of a cake. If it comes out clean, it’s ready! 7 – Remove from the oven and let the cupcakes cool down. Finally, if you are not completing the garnishing right away, put them in an airtight container or ziplock bag. This will prevent them from drying. Make sure you eat them in less than 48 hours so they that stay tender and fluffy! Take this previously featured recipe to another level. There are many variations of the traditional chocolate cupcake theme that can really enhance the taste. Curious, aren’t you? Have a look at the banana, peppermint or Chianti chocolate cupcake recipes. If you’re not quite comfortable in making the previous recipe, watch the following video from Cupcake Jemma. It explains with all the detailed steps the technical part on how to make chocolate cupcakes. You can still use ingredients and the recipe mentioned earlier for a smaller batch of cupcakes. Planning is a must when baking 30, 50 or more cupcakes. As an example, you may need to freeze the basic cupcakes before you start decorating them. This step may or may not be required depending on how complicated the garnishing design is or how long it takes to make it. Make sure you correctly estimate the time it will take and ask for help if you need it. Since not everybody has a professional kitchen with 2 ovens, asking a friend to help by making half of the cupcakes can help to skip the step of freezing the cupcakes or having 1 or 2 sleepless nights! Make sure you plan wisely and, if possible, have people help you. I don’t know about you but making cupcakes for a wedding or any celebration is a good reason to have friends over, don’t you think? 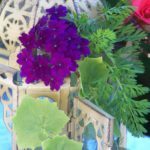 I hope you will enjoy making this recipe and would love to read your thoughts and appreciation. You can leave them in the comment section and I will gladly reply back if you have any questions. I personally don’t have much experience in baking pastries. I ‘m pretty sure I would ruin a three-tier cake attempt by not making it sturdy enough. The final result would be an ugly misshaped sugar mass collapsed on the table. No thanks, I’m leaving that to experts. On the other hand, making small pastries has the advantage that you can make many small samples until you get the desired taste, texture, consistency and overall look before baking those that are intended for the big day. The beauty of wedding cupcake design and decoration is that not only are they gorgeous but they are also easy to make compared to a multi-tier cake. Miscalculations are hard to correct when baking pastries. Baking a cake for a neophyte means a larger margin of error in comparison to baking small pastries. You have the option to make small portions as well but you don’t get the actual experience of making a full-size cake. Ingredients measurement, baking time are only some of the factors that can influence the expected result. Not to mention that decorating a large cake with a repetitive pattern that looks even and straight is not as easy as it appears. The art of pastry is one that allies many abilities, not only decorating techniques. You need to know about food chemistry. You must understand how to select dominant flavors and complementary aromatic garnishes. Most importantly, if you dream of really spectacular cake design, you need to have a very good knowledge of “pastry engineering”. If your wedding cake project is ambitious, I greatly recommend hiring a professional baker. make sure he or she has a recent portfolio and many good references. Don’t hesitate to ask for a list of past client you can contact and ask questions. Especially if you are planning to have a masterpiece type of cake. Ask them how satisfied they are with their cake and if was made on time and according to what they requested. Needless to say that cupcakes have become a very popular wedding pastry. We see them everywhere on wedding cake stands, candy and pastries bar and even as guests favors. Moreover, it often replaces the common multi-tier cake or is offered decorated to look like a smaller wedding cake version. I hope you enjoy the previous cupcake style and pictures. If you’ve done cupcakes for special events (big or small) in the past and want to share your thoughts and tips, please leave a comment in the section below. Perhaps you’re looking for an inspiring advice or have a specific question in mind. If so, don’t hesitate to leave a comment. I’ll answer to the best of my knowledge.